Short, mind-blowing videos -- is there anything better the internet era has given this world? Aside from unfettered access to a decentralized network containing the sum of human knowledge? We say not. So when you're churning away at your desk job, looking for a quick escape, load up a few of these videos, which all come in at right around a minute, or even less. What did your parents tell you? Always -- ALWAYS -- look both ways before crossing the street. How the truck driver stopped so quickly is a mystery. "Escape from death" might be a bit strong, but when you're just trying to get your Instagram game on and a jet ski comes barreling toward you, it probably feels that way. Bike racing in South Africa offers incredible scenery and the rare chance to collide with an antelope. Just when you think a seagull catching a ride is the only crazy thing that happens, BOOM. This crab thought it would be safe from predators if it carefully surveyed the water from land. 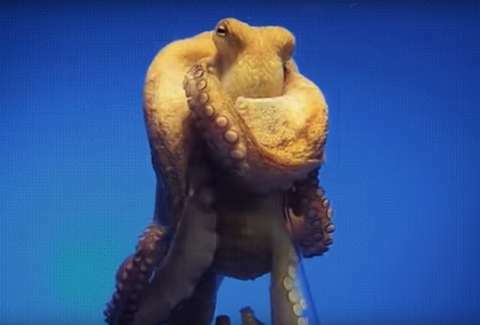 It didn't count on this ambitious octopus saying "screw you" to its normal water habitat. "Greatest" and "all time" appear more frequently than they ought to on YouTube, but in this case, they're appropriate. File this octopus escape under "nightmare fodder." Not sure how this guy learned this trick. Not sure we want to know, either. What are you guys doing?! Get back in that car! And put it back on two wheels! Yes, that is a catfish CLIMBING UP CAVE WALLS. You'll never sleep again. This guy is just chilling at a gas station, unaware he's about to experience the luckiest moment of his life. Follow the Thrillist Entertainment editors on Twitter: @ThrillistEnt.